George leads the day-to-day operations and strategic vision for Fit-Line Global. He is an integral component in Fit-Line’s dedication to quality and on-time service. He has been a leader in the operations management function for over two decades and is an inventor of nine U.S. patents. Alvarado ensures that Fit-Line not only meets but exceeds expectations and needs for its customers. With a focus on empowering employees and establishing accountability, Alvarado has successfully developed the culture of operations within Fit-Line which revolves around quality, on-time deliveries, and price. 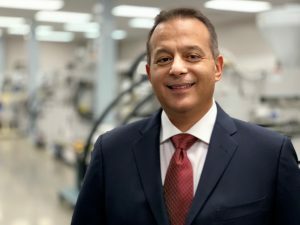 Alvarado graduated from Western Governors University with a degree in Business Management but has also received training from ITT Technical Institute where he graduated from the School of Design. After receiving accreditation from Cerritos College for Plastics and Composites Manufacturing and International Quality Management standard ISO 9001, Alvarado went on to help several companies obtain certifications under the same ISO 9001 standard. His accomplishments have been recognized in publications such as Automation Magazine showcasing his efforts in saving company money and reducing time to market through virtual prototyping. George ensures Quality without Compromise. He is Fit-Line Global!